"As long as man doesn't interfere, nature works perfectly." The other day, I read a very interesting article that I would like to share with all of you. 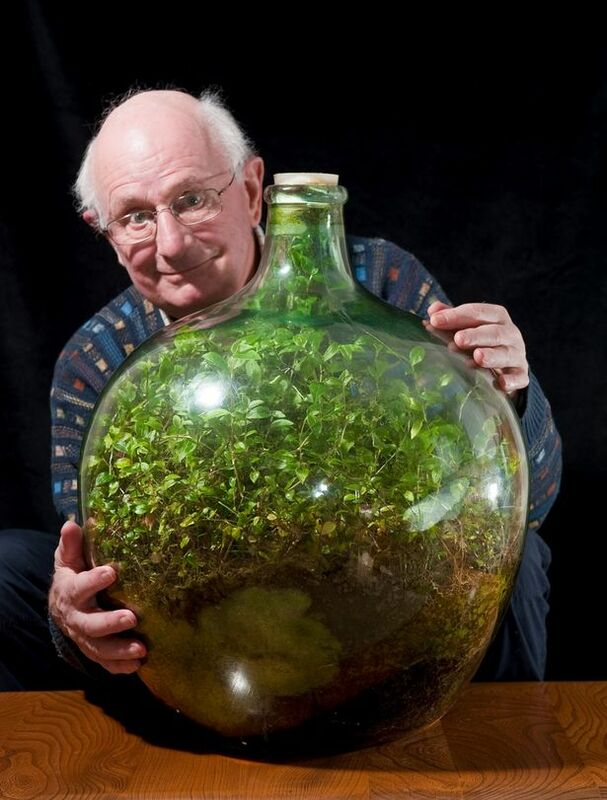 A man planted four seedlings in a glass bottle in 1960, and watered it once. He then sealed it and hasn't watered it for the past forty years. The plant is alive and wonderful. I felt this idea was truly brilliant because it is like a demonstration of quite a few things that we have studied in school. For example, plants consume oxygen and give out carbon di oxide during respiration, and consume carbon di oxide during photosynthesis to produce food and releases oxygen. The cycle repeats, and the plant is completely self sustained. The plant absorbs water from the soil and consumes it. Excess water is given out into the atmosphere via transpiration. Water vapour form clouds and it rains to give the water back to the soil which is then absorbed by the plants and another cycle repeats. If a plant dies, it gets decomposed and goes back to the soil as nutrients and another plant absorbs the nutrients to grow. Another cycle. So, basically, plants are completely self sufficient, and the so called "Circle of Life" and other cycles are demonstrated, albeit subtly without anyone realising it. I thought that this idea was very interesting. And just for the heck of it have decided to try it out myself. So I took an old Priya Pickles jar, took some good soil from my garden, some dried leaves sand crushed it, one semi dried leaf off the ground and tore it and mixed it with the soil, just to make it seem like some real soil. And I chose Fenugreek (methi / menthya) as the plant of choice, mainly because I have grown it before and I know it grows very easily and quickly, not too tall and the seeds are available in the kitchen :-) Then I put it in and shook it like James Bond's Vodka Martini. Added some water, and left it yesterday. Today, I observed the bottle and saw the seeds have begun germinating. I am already excited. Now what will happen in case of disease, I don't know. I know that there are some bacteria in the soil as well, though no insects. I think if this is successful, it would be great to add some small insects too, like an aquarium, a terrarium. As in, a small earth, an ecosystem of sorts. Of course, all this is mere wishful thinking. I have done no research on this, though I know that there are plenty of sites that explain a lot of things. Like adding charcoal to keep the soil fresh, etc. But as an idea, I liked it a lot. In terms of maintenance, it's nothing. 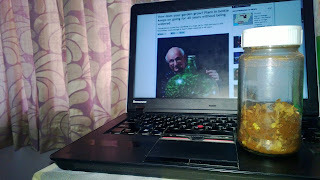 And if this works, probably next time, I shall use a beautiful glass jar instead of a pickle bottle. And grow a Bonsai instead of Fenugreek.